Even if you think you’ve seen – or tasted – it all in terms of online bingo sites, Tasty Bingo is a treat for the most jaded palate. Why? The delicious fact of the matter is that Tasty Bingo focuses on a topic that is dear to almost every player’s heart … after bingo itself, that is. As we’ll discover in our Tasty Bingo review, the Tasty Bingo site is themed on food, and you can indulge to the max – it’s all calorie free, from the Friday Feast to the Pizza Pattern Bingo. (Of course, if in real life you sample one of the treats the site’s Tasty Recipe section describes, it will be a different story!) Joining in the banquet is fast and easy; just complete an easy-peasy registration form and you’re in. Settle down for a satisfying game at any of Tasty’s bingo rooms, open morning till night. The menu features 90 Ball Bingo, a British delicacy, or 75 Ball Bingo, with its American tang, and the spicy chat is all part of the fun. A zesty side order of assorted slots, casino table games such as roulette and blackjack or instant win games will really hit the spot. If you are hungering for a truly tempting payout, try one of the progressive jackpot bingo games – either the Chocolate Sundae or the Banana split will prove deliciously satisfying. Tasty Bingo will sweeten the deal for new players with a 200 percent welcome match bonus of up to £200 on their first deposit plus an extra £10 for fun and for free. That sets the tone for the goodies that are coming up – giveaways of cash, bingo cards, free bingo games and Asda store vouchers. Weekly prebuys give you a shot at more yummy prizes without even showing up for the games. The Joy Gem VIP club rewards loyal players with fittingly royal treatment; the higher you climb up the bejeweled levels, the better the freebies and benefits become. 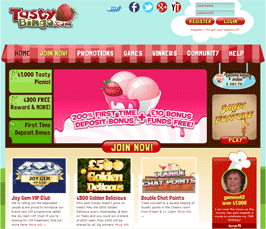 The Tasty Bingo site is owned by 888.com and operated by Cassava Enterprises, which is licensed by the Government of Gibraltar. Tasty Bingo cares about you as a customer and makes sure that your personally identifying information and financial details are safeguarded online with state of the art technology. At the same time, you may view an easy to use log of your playing results whenever you choose. The site makes use of a Random Number Generator (RNG), which is tested regularly to ensure random and fair results. To help you find your way around, there is an excellent Getting Started guide, as well as a FAQ section. If you’d like further help, ask a CM from within one of the bingo rooms, click on Chat Now, send an email or telephone (toll free inside the UK).